A very big thank you to everybody who helped me try and sort out the controller board on the back of the Proview, especially those over at electro-tech-online.com – alas, it seems to be no more. I managed to make it make noises, nice charging type noises – a bit like the old camera flashes. But, not a bean from the displays – eventually it just stopped and now pretty much every wire is grounded. Oh well. This is only a minor setback, thought I, as at least I have a couple of 1.3” VGA displays now, so that I can retro fit the V4 into a V8 and concentrate the pico project with the easier-to-muck-about-with Proview shells. However, as with everything else to do with HMD’s it’s not as easy as that. Nobody knows anything. Nobody is willing to try and know anything, and quite frankly it’s like pulling teeth just talking to people about this stuff. I have two serviceable 1.3” LCD displays, with working backlights all ready to plug into the V4 shell; all I need is the controller board. There are hundreds and hundreds of controller boards knocking about, so I thought it would be a cinch to find a controller board to mate with these panels – they can’t, after all, be completely proprietary – surely there are a very limited number of ways to drive a TFT display from the late 90’s! The displays are marked as T13VM400 with a marking under that as 2CR0078. 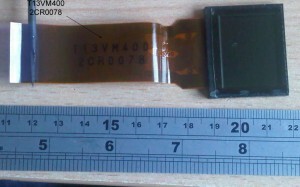 Additionally, etched onto the ribbon is the code HCD 200. HCD 200 seems to be etched onto quite a few small Sony displays of the time, as used in projectors. The only reference to T13VM400 I can find is here: (translated Page). The ribbon is a 45 pin jobbie. So, they appear to be Epson Seiko T13VM400 units. Nice one, simple, let’s find a controller board. As always, neither Kaiser no Rockwell Collins can help. Nor can Epson. In fact Epson said I should try Sony, as they now own that part of the business, but I am having difficulty getting a contact at Sony. I have emailed in the region of 20 companies related to either controller board supply, or HMD’s – with nothing but negatives so far. Other clues as to how to drive these panels come in the form of the chips on the Proview; they are XILINX XC3142A … These you can see on the bottom of the back board, covered by white stickers, they are 100 pin. As always, it seems, I am lost. Almost as lost as all the documentation on every bloody aspect of everything to do with HMD’s. Is 12 years really such a long time ? I still have old programming magazines telling me how to make a ‘bird’ fly across the screen of my ZX81. Why don’t massive companies like Kaiser, Rockwell, Sony, Epson, Seiko, Vista and so on have documentation pertaining to products which they mass produced and sold throughout the globe ? It beggars belief. i believe your display is the ones used in V8’s . I have a V6 and i was doing some research some time ago on upgrading it to V6. I did some search through old epson product pages using http://www.archive.org back then. I have already emailed Virtual Research directly – I’ll pop Tone an email too. Sadly, this is the way the world works; old documentation on products no longer made is not preserved in any fashion – it is thrown away. For all you know, though, they -do- have the documentation, but they aren’t providing it because you are a single hobbyist, they may think you are doing industrial espionage, a spy for one of their competitors, or they just don’t want that information going out to someone who didn’t originally buy the product themselves. Furthermore, none of the companies are going to talk to you, likely, because you won’t be buying anything in quantity (>100,000 units); you are an ant to a human to them. My advice: Set these HMDs on a shelf as historical items; perhaps one day you’ll come across a controller box or something for them – if not, no big loss. Perhaps take one apart, and study the parts (the dead one is a good candidate) – mainly the optical path, the optics, etc. 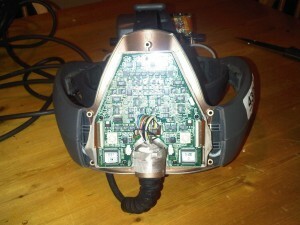 Then use your knowledge to build your own HMD, using more commonly available parts. 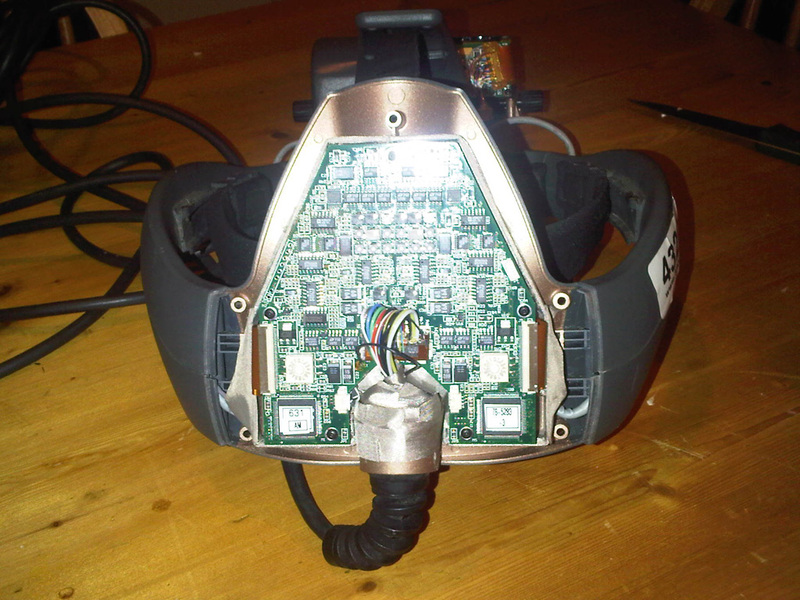 Or – transplant the parts from another HMD, like a Vusix, into the optical path of the Proview. Virtual reality, augmented reality, etc – in the hobbyist sphere – is still a very-much homebrew experience; little of the “professional” equipment has trickled down to the hobbyist at prices that are affordable – what little has is snatched up quickly. Not too many months back, I had the chance for a complete VPL DataGlove on Ebay, but I was outbid by a dollar – that really ticked me off, but that’s the way things go, and besides, a DataGlove isn’t that difficult to homebrew. Of all the devices for homebrew development, 6DOF tracking is the most difficult by far, but even that has become easier now with the hacks available for the Kinect. I would i like find out where can i buy the second image of the hcd 200 ribbon that was displayed on your page. I would really appreciate it for your help. Do you just want a higher resolution of that image without the text ? If so, I can upload one for you, unless you want to sell it to somebody else, it is free of charge, obviously. 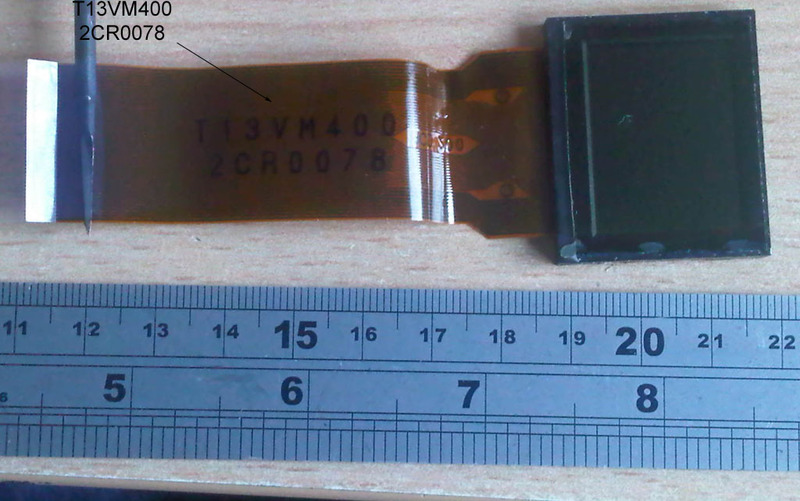 Hello, I currently use a minilab KIS DKS 1510 and my LCD is about to let go, I actually replaced it two weeks ago, but apparently one that I thought the first opportunity is is older than my previous LCD, I wonder if you have an LCD unit for sale, and please have how many? 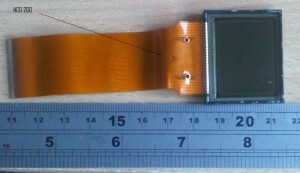 LCD resolution: 1024×1366 pixel apochromatic MSB.